It was a beautiful sunset except the cloud of black smoke coming from the west. We got into the car and drove toward the pillar of thick blackness, but nothing prepared us for what we saw. 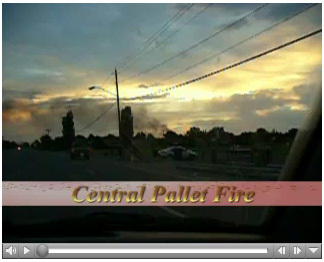 This three alarm fire at Central Pallet of Utah was originally called in as a grass fire, but it quickly spread and flames were leaping up forty feet into the air. Mike and I didn’t dare get any closer and cautiously drove by on Bangerter Highway. Update 07-05-06: The next day, Central Pallet of Utah was open for business. They were able to put out the fire before it reached the business offices, so they were able to start their recovery early. I wish them the best of luck. That fire was so scary that I am proud of their pluck for picking up the pieces so quickly. 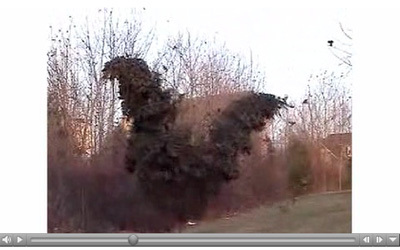 Scott Fraser shot this awesome video of starlings swarming. They flock to one tree, weighing it down. When they fly, they all jump up at once, bouncing out of the tree with force. I love the way starlings fly. They act like a swarm of insects far more than a flock of birds. I love to see the black clouds of birds above my town. Starlings are our favorite birds. That’s why there is a Starling Fitness and a Starling Travel. Everything we do is under the Starling Studios name. When we take off, we all jump up at once and with such force that you can’t help but look at us. Stacey, Dan, Mike and I went to the Sugarhouse Art Festival on Independence Day. It was better this year than the last few years. I bought myself a new little purse. I tend to change purses about every month or so. Luckily, I don’t spend more than $10 to $20 on a purse. This one was eight bucks, so I’m not feeling guilty at all. It has lots of pockets for my gadgets and toys. On the walk back from the festival, we were drenched in rain. I worried that the rain would ruin the holiday, but the hosts at the BBQ weren’t scared of a little precipitation. They put up tents and tarps and we sat outside and ate brats and burgers. I should of known that a little rain wouldn’t change their party. They used to work at REI, afterall. I met more neighbors yesterday than I have in the three years we have lived here. When she suggested a July Fourth Block Party a couple of months ago, I had no idea how well it would work out. Somehow, I thought for a block party to work, we would need to block off the road. Instead, we were all crammed into their back yard, huddled under tarps to avoid the rain. I think I found an enterprising young man to mow my lawn. I met the humans who own the dog, Oscar, in our neighborhood. I even met the new neighbor who bought Madison’s house. It was all quite social and I’m glad to be hiding, pajama-clad, in my house today. I just feel sick. My first instinct was that Amanda Congdon’s video announcing that she has been asked to leave RocketBoom was a publicity stunt. God, I wish it had been. At first, Andrew said that Amanda’s video was the first he had ever heard about it. Then, a post was made on RocketBoom stating that Amanda was moving to L.A.
Then, Amanda refuted Andrew’s statement of surprise. As of this point, Andrew says that Amanda’s For the Record entry is out of context and he’s going to bow out of the conversation. This whole thing has become such a drama. Watching it from Utah, it seems like a junior high fight. It reminds me of the episode of The Office when Dwight goes to Jim to form “an alliance.” As far as I can tell, they both need to stand with their noses in the corner until they can play together nicely. Worse still, I feel this overbearing guilt because I have been so jealous of RocketBoom and the attention it has gotten over the last few months. I know I don’t control the universe, but right now I worry that I inadvertently put a curse on Amanda. I feel like my jealousy somehow caused their self-implosion. Ramen is smaller now. I know it for a fact. Don’t get me wrong. I’m not complaining about the reduction of noodle-goodness. I would never complain about a 17-cent meal. I just eat it gratefully and know that the high starch and fat content is enough. But Ramen IS smaller now. I know it because the noodles fit in my smallest pan and they didn’t before. I’ve had these pans since we got married. I don’t know who gave them to me, but thank you. They have lasted longer than the plethora of crockpots we received from everyone else. They don’t have that fancy non-stick surface, yet nothing sticks to them. They have been the best pans I could have ever had. 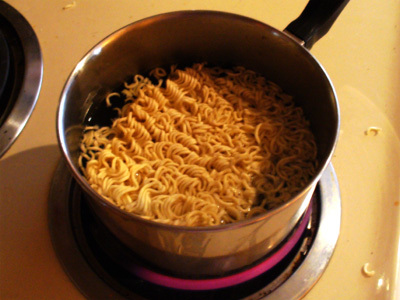 It used to bug me that the Ramen noodles didn’t quite fit in my smallest pan. Not enough to use the larger pan, but it still bothered me. I considered popping the noodle brick in half, but then they wouldn’t be as enjoyable. No, I just let the Ramen sit in the pan diagonally until they were soft enough to conform to its edges. But the Ramen is smaller now. It fits easily into the pan. That means I’m getting less noodles, but I’m happy. Because I’m not the kind of person to complain about a 17-cent meal. Since deciding not to move to California, I’ve realized that we need to grow a geek community that I can associate with here. I feel so isolated and alone as far as work is concerned, so I decided to spearhead BarCamp here in Utah. 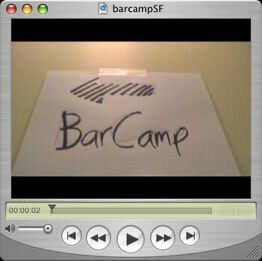 I am in the process of setting up montly meetings for BarCampUtah. BarCamp is a meeting that started up in San Francisco in reaction to FooCamp, which was an invitation-only party given by O’Reilly. Some of the people who weren’t invited to FooCamp, set up BarCamp. What I’m trying to create is a geek community in Utah. I want to have a monthly meeting where we can “show and tell” or maybe just “hack together.” This video, created by Ryanne, is my inspiration. I want BarCampUtah to be like Super Happy Dev House. We don’t have a spot where things can go all night, but at first, I’m just hoping for a few hours where everyone can talk and share ideas. This video, also by Ryanne, shows what our little meetings could eventually evolve into. BarCamp in San Francisco is a full-blown conference with sponsors and hosts and lots of ad hoc sessions. I have been struggling for a good venue that has wireless Internet and room for us to grow. I think I have found us a spot, but I need to wait to announce it until I get the application back. In the meantime, if any of you have been wishing for a geek community in the Salt Lake area, we are growing it right now. Please send me your information on my Contact Me form, including your full name, email address and phone number and I will make sure that you are included. That means Google knows that I live in Utah, even though this webcomic doesn’t. Google AdSense is not only gathering information about the website it advertises on, but takes note of where the user is coming from to give directed ads. I just hit the point where I feel like Google knows too much about me. 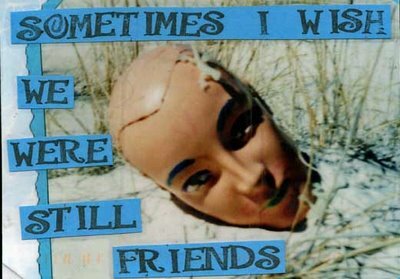 I just tipped over into paranoia. I have my email through Google. They have scheduling and calendars. They are working on spreadsheets. They can track every websearch I do. They even know which websites I read without using their search engine and send me advertisements for my local community. That’s all nice and convenient, but I really don’t want them to know all that information about me. All of a sudden, 1984’s Big Brother is looking a lot like a harmless search engine. Pick Me! » Happy 7-11 Day! I have no idea if 7-11 is still giving away free Slurpees on 7-11 day, but I always like our version of celebrating it better. Just for clarification, this trailer shows the house eating the police car with the police in it. That didn’t happen in the movie. I’m going to be honest. The animation was unpleasant. They loved to play with the “camera effects” like the opening scene of the movie in which they followed the fall of a leaf from a tree. It made me a little motion sick and felt gratuitious. I guess I’ve been spoiled by Pixar because the characters looked like poorly animated dolls to me. Gravity didn’t seem to work correctly in the Monster House world. That said, the writing was excellent. There were many times that I laughed out loud at the dialogue. There were plenty of jokes that didn’t make it into the trailer. I liked the character development. The babysitter was exactly how I remember my babysitters being when I was a kid. I loved the scene where his parents leave him alone at the house. 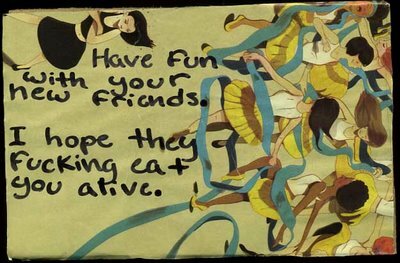 The kids are at that strange age between childhood and adulthood. I remember it well and they keep it pretty realistic. This movie might be a little too scary for children under 13. At one point, the three heroes have snuck in the house undetected and are investigating with flashlights strapped onto water guns. It reminded me of a scary video game that I played. That was pretty intense. The movie takes a particularly dark turn in the explanation of the origin of the Monster House and the kids find a gruesome discovery in the basement. At that point, it was a little too “Silence of the Lambs” for me. Sure, the “eaten” people and dogs show up during the credits of the movie, making everything right in the world, but until that point, we were left with at least three unsolved murders on our hands. Would I go to see this movie opening week? No. I’d probably go see Over The Hedge again. The animation in that movie doesn’t make me motion sick. Would I go to see this movie in the dollar theater? Yeah, it’s worth paying a couple of dollars to see the scratched film version. Would I buy this movie when it’s released on DVD? No. It’s definitely not worth cluttering up my collection. There are so many good Halloween movies to watch instead that this one would just get lost in the pile. Would I return this movie if I received it as a present? No. It’s good enough to watch a couple of times and definitely good enough to keep instead of bothering with the return process at a store. If you have seen all the other new releases on July 21st and have an afternoon to spare, I would recommend Monster House just for the witty dialogue, but don’t expect anything beautiful to come out of the screen. You could probably watch Monster House with a blindfold and get 90% of the enjoyment from it. They are meeting monthly at dinners and the next one is July 26th, 6:30 pm at Brick Oven (111 East 800 North, Provo, Utah). If any of my Salt Lake City readers are interested in creating a dynamic geek community here, this is where we need to be. I have left an email with Phil B. Burns, the organizer to see what I have to do to make this a reality. Not only are hugely successful Geek Dinners already set up, he has set a day for the BarCampUtah conference: August 26th – 28th, 2006. I am so happy that all of this is coming together so nicely! If you enjoyed this video, make sure you check his website, 90 Seconds of Dave about once a week to see what new work he has posted. 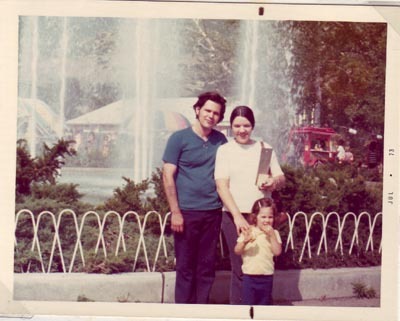 In July of 1973, my mom’s family came from Wisconsin to visit us in Salt Lake City. We did a lot of the touristy stuff while they were in town, but my favorite was the trip to Lagoon. Lagoon is an amusement park that is about twenty minutes north of Salt Lake City. It’s so close, I consider it in Salt Lake City, but in actuality, it’s in an entirely different county, so I guess I can’t really claim it. In this picture, we are posing at the “fake” helicopters. My cousin, Heidi, is on the left and I am on the right. If you look closely, you can see that I have my arm on the arm of the placard. I thought I had to put my arm there just like the picture. In the background, you can see the entrance to the Animal World Train. 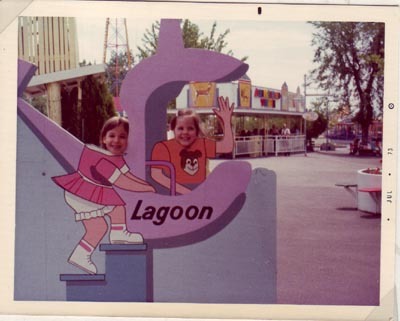 Lagoon still has that ride, but I don’t know if they still call it the Animal World Train. I haven’t ridden it in a long time. All my memories from the train ride are scent related. I will smell animal pens and it will remind me of Lagoon. Sad, but true. Lagoon smells like animal poo. Today I met with Phil Burns about BarCampUtah. It looks like we are going to be able to get this going! BarCampUtah will be August 26-28th, 2006. This picture shows us riding the “real” helicopters. 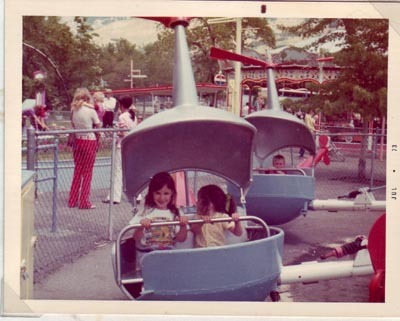 I find it interesting that this ride is considered a “real” helicopter in my memory. Even now, I look at this contraption and categorize it as a helicopter, even though it has little relation to what an actual helicopter looks like. This was a really cool ride. You would push the bar away from you to raise the helicopter and pull it toward you to lower it. 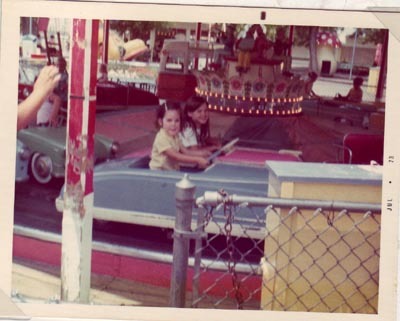 Every time I rode this ride, it was a fight with the other kid about how we were going to fly. I would always want to fly high, but half the time, I would get stuck with some kid that was scared and wanted to fly low the whole time. That’s my cousin, Heidi, on the left and I’m distracted on the right. If you look at this picture, you can see my dad on the left (in the turquoise shirt) and my mom on the far right (with the white bow in her hair). I have no idea who took this photo. It must have been Auntie Doris or Uncle Johnny. This picture is of the shoe. I remember it being Old Mother Hubbard’s Shoe, but she’s the lady who didn’t have any food for her dog, so it can’t be that. I think it was the shoe that the Old Lady In The Shoe lived in. You could go in it and climb on in when I was little. Now, the shoe is still there, at Lagoon. It’s near the concessions stands, but the entry is boarded up and it has been repainted a bunch of times. Last time I saw it, they had painted it pink. From left to right: Me, Heidi, my dad, and Uncle Johnny. I don’t think I was picking my nose when this picture was taken. I was probably biting my nails or sucking my thumb. That’s me on the left with Heidi on the right. We’re on the cars ride which was like a Merry-Go-Round, but with cars. I really felt like I was driving, so I had to keep my hands on the wheel. I love how classic these cars are. They look like old Chevys and Fords. They look like they burn more gasoline than an SUV. Check out the white wall tires. If you look in the background, you can see the Shoe (see previous entry) and a white mushroom with a red polka-dot top. Those were free little things that kids could play on without any tickets. It didn’t take Lagoon long before they had the All-Day Pass where I could ride anything I wanted all day long without having to count out tickets. These are the paddle boats. That’s Uncle Johnny on the left with Heidi. 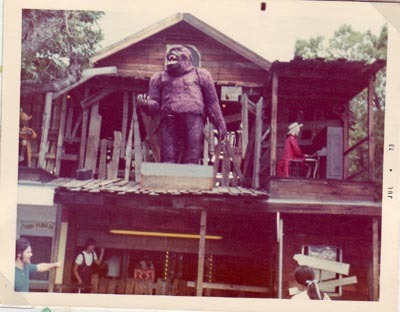 I didn’t get to go on that ride because I was too little. 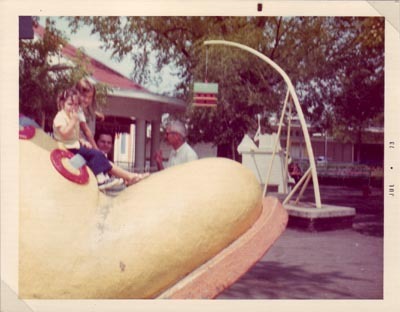 I did get to go on it years later and it was like torture for me. I was completely unable to keep peddling to keep the boat going. My parents were right, I was too little, but I still felt left out. Lagoon doesn’t do the paddle boats anymore. They have the Tidal Wave and The Turn of the Century where we used to get on the paddle boats. 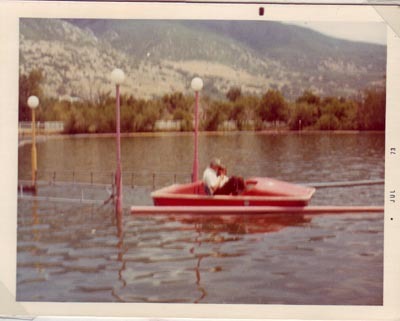 I never really got to ride the paddle boats as an adult or even a teenager, but I think that it would be a fun, romantic thing for a couple to do. I guess amusement parks aren’t about romance. The last picture I have from that Lagoon trip. It is of my family in front of the fountains. The fountains are still there and the Sky Ride still passes right over them. Around that fountain and other areas, they have large areas of planted flowers. The scent of tulips and marigolds can snap me back to my memories of Lagoon. Yes, it’s true. Lagoon smells like animal poo and pretty flowers. We all look so different now. I’m older now than my mom was when this picture was taken, yet I feel so much younger because I’ve never had a child. It’s so strange to look at these pictures and wonder what my parents were thinking. They were probably pretty tired. Today is Pioneer Day in Utah. We light fireworks and barbeque meat. It’s like Independence Day 2.0. I am going to enjoy my summer day and if you’re not from Utah, set something small (like a match or a candle) on fire for us today. 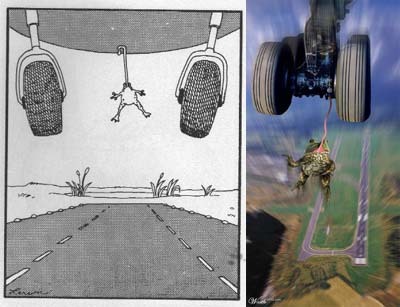 Far Side Comics brought alive by artists! I love these! Jory was looking at my business card at SXSWi in March when she mentioned it to me. I nodded and pretended that I would truly consider registering my weblogs with Blogher. I waited for Jory and Evelyn to sign their book when all I wanted to do was run away. The BlogHer Conference starts tomorrow and it seems that everyone is going to it. Everyone except me. Somehow, the whole Blogher thing just bugs me. I guess it’s because I don’t consider myself a woman blogger. I just consider myself a blogger. Sure, I’m a woman, but I’m a writer first. I guess the whole Blogher phenomenon bothers me because it feels like segregation. It feels like it separates women from men. I don’t want to believe that women writers are any different than men writers. I want to believe that we are all writers first and gendered humans second. Plus, the idea of being at a conference of all women just sounds incredibly uncomfortable to me. I am SO busy right now. Today, I have a garage sale planned with my family. I have been collecting our usual DI stuff to sell. This morning I have a few hot hours planned. I went to the Geek Dinner on Wednesday and took video of almost everyone there. I have yet been able to go through the footage, though. I really want to make an excellent video showing you how fun it was. I hope the background noise didn’t get in the way. Instead of working on the Geek Dinner video, I have been feverishly working on my new walking video for Starling Fitness. It is the best one I’ve done and I’m really excited about it. Lots of people bought the Swami Beach Walk Video, and I hope even more people try this one out. I’m so excited by it that it has taken up all my time recently. In essence, I’m REALLY busy right now and it feels so good. I love it when I’m able to accomplish a lot of things. It makes up for those times when it feels like I’m spinning my wheels. Have you ever gone to a grocery store for fun? Mike and I do all the time. Last week, we wandered the aisles, giggling and laughing. I pointed to the rack of t-shirts. One of them announced “Property of Jesus” complete with a Jesus fish in the middle. We listened further. The voice was talking about cheese. She had said “domestic cheeses” but both of us had misheard her. After reading all the comments over the last two years, I realize that my little entry is woefully inadequate. Some people say it helped them and the many stories in the comments help people realize that they are not alone, but I feel as if my entry just wasn’t enough. We humans are so complicated.